"US, World War I draft registrations records 1917–1918", digital image, FamilySearch, Utah, Salt Lake. Draft Division# 2 Roll# 1983911. "Serial# 409 Order#407, Dwight Putnam Sackett, 44 W Taylor Ave Salt Lake City Utah, Age: 38, b. 16 Sep 1879, white, native born, structural ironworker at Utah Oil Refinery Co, E.H. Dundas, nearest relative: Mary Jeannette Sackett, 44 W Taylor Ave Salt Lake City Utah, Registrant: Tall Ht, Med Build, eyes blue, hair dark, no disabilities, Reg: 12 Sep 1918 at Murray Utah." 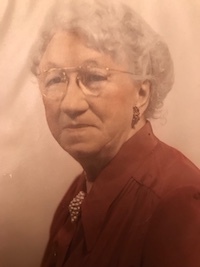 "U.S. Social Security Applications and Claims Index, 1936–2007", database, Ancestry.com, "Sackett, Dwight P, b. Warrensburg, IL, 16 Sep 1879, claim date 14 Oct 1946, type: life claim, listed as Dwight P Sackett 12 Dec 1978." 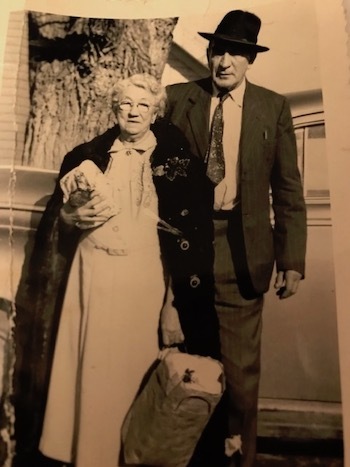 "Washington, Death Certificates, 1907–1960", database, Ancestry.com, "Sackett, Dwight Putman, d. Sunnyside, Yakima County, Washington, 9 Jul 1955, age 76, father Orange E Sackett, mother Emma Chesly." "Colorado Statewide Marriage Index, 1853–2006", digital image, FamilySearch, "5 Feb 1903, at Victor, Teller County, D P Hackett [sic], 23, & Mary J Carty, 24, by R L Thomas, JP." "Ireland Births and Baptisms, 1620–1881", database, FamilySearch, "Mary Carty, b. Wicklow, Ireland, 7 Mar 1879, dau. of Bernard Carty & Dorah Carty Farrell." "Washington death index, 1940–2014", database, Ancestry.com, "Sackett, Mary J, d. Yakima, Washington, 16 May 1965, res. Sunnyside, Washington." Death certificate in possession of Warren Clements, "Mary Jane Sackett, d. Sunny Haven Nursing Home, Sunnyside, Yakima County, Washington, 16 May 1965, age 86, b. Fresenbury, England, 27 Jan 1965, married, housewife, father Bernard Carty, mother Dora Farrell, informant Mrs Oliver Bond, cause pneumonia." "US City Directories, 1822-1995", digital image, Ancestry.com, Salt Lake City, Utah, 1928, 1929 "Sackett Dwight P (Mary J) formn U O R Co r 44 W 24th So. "; 1934, "Sackett Dwight P (Mary J) h44 W 24th So. "; 1935, "Sackett Dwight P (Mary J) iron wkr h44 W 24th So"; 1936, 1939, "Sackett Dwight P (Mary J) steel wkr h44 W 24th So. "; 1941, "Sackett Dwight P (Mary J) ironwkr h44 W 24th So"; 1942, "Sackett Dwight P (Mary J) tchr Adult Evening Sch h44 W 24th So. "; 1944, 1946, "Sackett Dwight P (Mary J) h44 W 24th So." "US World War II draft registration cards 1942", digital image, Ancestry.com, "Serial U3534, Dwight Putman Sackett, Sr, res. 44 W 24th South St, Salt Lake City, Utah, mailing address 3096, 93 St, Jackson Heights, LI, NY, age 62, b. Warrensburg, IL, 16 Sep 1879, contact wife Mary J Sackett, 44 W 24th South St, unemployed, race white, ht 6', wt 210, eyes blue, hair brown, complexion sallow, scar on top of head. Reg 254 Queens NY, 25 Apr 1942, stamped Murray, Salt Lake County, Utah."